This is our VSA club’s 30th Annual Vietnamese Culture Night. 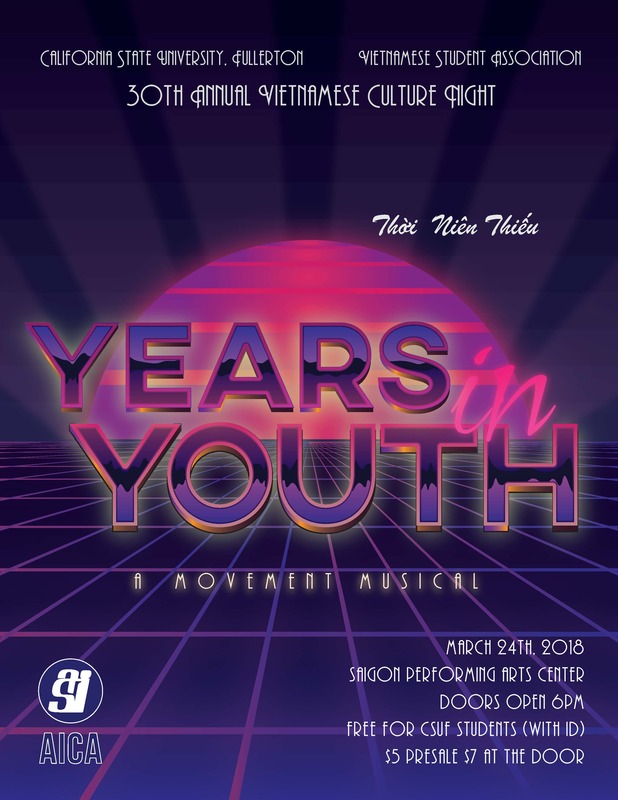 This years production, “Years in Youth: A Movement Musical” aimed to continue the long tradition of our club’s 100% student-run Vietnamese Culture showcase. Every year we strive to bring together every single VSA club member to participate in our celebration of our culture and traditions in a single, one only night event. There are so many different committees design to fit the interests of any type of member; whether it be stage acting, traditional Vietnamese dance, fashion show modeling, modern dance, or back stage production crew. It is no doubt that we are an extremely low budget production, however with the help of an amazing sponsorship, marketing, and outreach team, we were able to increase our production value to provide the best show to the community as possible. The one of the main goals of this years Vietnamese Culture Night was to continue what the event was created for 30 years ago, that is to bring a strong narrative about the Vietnamese American experience to the community. After a long and insightful journey to find what stories have yet to be told, I decided that I did not want to specifically share what my generation of Vietnamese have experienced, but rather I wanted to focus on my parents and their American Youth. I was then set on telling a coming of age story about the high school lives of my parents and really just show everyone that our parents, too, were once young, ambitious, and curious people. Our narrative was set in the 80’s and we utilized the amazing power of dance to help narrate our story in what we have termed, a Movement Musical. Being able to be at the helm of such a great group of people has been an honor. One of the biggest challenges that we faced as a club was rehearsal scheduling. All of the VCN Coordinators and myself understood that all of our show’s participants were working off a purely voluntary schedule on top of their academics, work, and other priorities. It could be hard to ask members to take hours out of their day, multiple times a week just to practice some dancing or acting. Though we could not get 100% attendance every single rehearsal, what made me very happy to see was that members and my VCN Coordinators were willing to find extra time outside of the set rehearsal schedules to perfect their performances. As I cannot expect others to have the same kind of dedication to this project, this dedication is saw from my members meant so much to me. I think that just constantly being grateful for all the hard work everyone had been putting into my vision really helped the club positively move forward.